All-terrain vehicles (ATVs) are motorized vehicles designed to be used by a single operator on off-road areas and not public roads. “ATVs have become very popular over the past 10 years. They are unstable vehicles with a high center of gravity and can sustain high speeds, making them especially unsafe for children and teens”, says Debbie Friedman, MCH Trauma director. Unfortunately the number of serious injuries sustained has also increased. The MCH Trauma Centre sees approximately 20 patients a year that have sustained serious injuries while riding on ATVs. These injuries include: brain injuries, spinal cord injuries, dental and facial trauma, abdominal trauma, and multiple fractures. This is clearly a high risk activity. According to the Canadian Pediatric Society, in Canada nearly 25% of ATV related deaths are among children under 15 years of age. Too many passengers, which changes the balance of the vehicle and makes it harder to control. In December 1996 the ministry of Transports Québec asked the National Assembly to adopt the Act respecting off-highway vehicles. This legislation brought in rules to deal with safety issues. In 2006 the ACT was amended to tighten the rules and improve coexistence between trail users and neighboring residents. In 2009 the ACT respecting off-highway vehicles was amended to allow for a passenger seat. Wearing a motorcycle type helmet is mandatory in all circumstances and all types of trails. Replace the helmet after 5 years. The rider must also wear gloves and appropriate footwear. 16 years of age is the minimum age for operating this type of vehicle. In addition, riders 16 and 17 years of age are required to take a training course and to hold a certificate issued by Federation Québécoise des clubs quads. All new riders should take a training course. To carry a passenger the driver must be at least 18 years of age. Children younger than 16 years of age should not be driving an ATV. Wear a properly fitting approved helmet for ATVs or motorcycles (such as a helmet meeting the Canadian Standards Association, Department of Transportation/Federal Motor Vehicle Safety Standard, Snell or American National Standards Institute motorcycle helmet standards), with a visor or safety goggles. Wear bright clothing to make yourself visible. 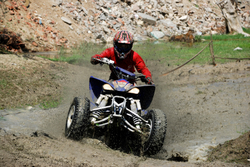 ATV drivers should take an approved training course. When operating a single person ATV, do NOT carry passengers. Check to make sure the machine is working properly before each use. Do not drive too far. Make sure that you can walk back if stranded. Consider using a buddy system on a second machine. Never drive in bad weather. Ride within your own skill limitations and those of your ATV. Never drink or take drugs and drive!